Acquisio is ideal for marketing agencies, especially those that focus on serving a specific market. If your Agency has access to client data, depending on the data, Acquisio's software could be a powerful way to deliver that data in the form of online ads. Acquisio might be too powerful for a small business looking to manage campaigns in-house. DoubleClick (DS3) is very well suited to a company that is operating several accounts across several Brands / Products / Regions and is heavily invested in Search and/or Native. If you're using DCM/Floodlights, the tracking is very accurate and very easy to import into DS3 to have full front-to-back tracking, especially with the Business Data element. Provides multiple methods of viewing and sharing campaign data. It is definitely an upgrade from the basic PPC reports. Fully customizable and new features are being added regularly. Acquisio now provides support for the importation of the video campaign data. This saves her company lots of time as we used to have to do this process manually. Aquisio now has instant chat support in the platform which saves a lot of time as you can get quick answers to any problems you may be having. Setting up tracking URLs is very easy and it also helps us identify if any errors have occurred with it. This allows us track all types of conversions to the most granular level. 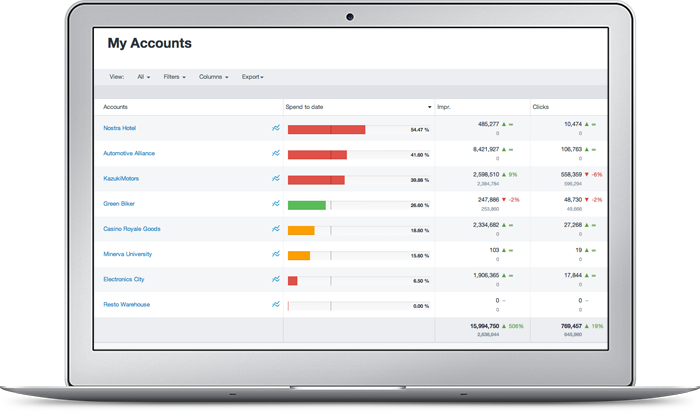 Accessing all accounts from Double Click significantly reduces the hours we spend on reporting. Any level of detail could be easily pulled out from the reporting tab. A very big strength of Double Click is that it's integrated with other publishers, too, besides AdWords. Some of the screens in the platform take a little while to load and you may need to refresh. More details on mobile campaigns would be helpful but Acquisio is limited by what is available in the PPC provider's API. Hopefully they will add support for more fonts soon. Reporting for display campaign - currently DoubleClick for Search doesn't provide reporting on the placement level and data is only rolled up to the ad group level. Conversions are not being pulled in from the engines. It is required to implement DoubleClick's floodlights to track conversions. I think the platform, with the latest release updates has a lot of great potential. The main decision, currently, is price and how that gets passed on to our clients. There has to be a conscious decision made on platform cost vs client spend and overall budget vs revenue. My experience with Acquisio is a tale of two situations. We had a customer service rep named Jeannie who was supernaturally gifted at anticipating and solving our issues. Her response time was so fast it felt like she was responding before I even hit SEND on our emails. Jeannie was deservedly promoted and support has been a little slower and we have had to make multiple requests to get answers since. They do not have strong support team. It is tough to get answer when I need it. They always refer you to an online guide and not an actual person. If so, the person is based out of an offshore team in India and does not know the specific client goals . We looked at other players like Marin and Kenshoo but found them to be overpriced and service to be lacking. Acquisio is very customer responsive, and the product is priced right. The new ad serving interface has helped with our efficiency by cutting the amount of time it takes to set up a campaign in half. The reporting summary tool has allowed us to to speed up the process of reviewing performance, which has improved our ability to optimize and led to even greater performance for our clients.